Units are modular, providing for custom configurations using standard components. Fabricated ice bins are available in 70 lb. ice capacity. Ice bins are 8" deep. Ice bin can be located either on left or right. 24" stainless steel speed rail. End panels are stainless steel. Highly polished finish. 1 1/2" NPT drain with 1 1/2" x 4" tailpiece. Body is all-welded type 304 stainless steel construction. CWS4-18L 20" x 48" 1800 series cocktail workstation. Ice bin located on the left. CWS4-18L-7 20" x 48" 1800 series cocktail workstation. Ice bin located on the left. Includes 7-circuit cold plate. CWS4-18R 20" x 48" 1800 series cocktail workstation. Ice bin located on the right. CWS4-18R-7 20" x 48" 1800 series cocktail workstation. Ice bin located on the right. Includes 7-circuit cold plate. 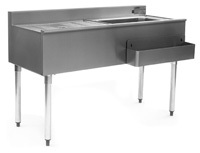 CWS5-18L 20" x 60" 1800 series cocktail workstation. Ice bin located on the left. CWS5-18L-7 20" x 60" 1800 series cocktail workstation. Ice bin located on the left. Includes 7-circuit cold plate. CWS5-18R 20" x 60" 1800 series cocktail workstation. Ice bin located on the right. CWS5-18R-7 20" x 60" 1800 series cocktail workstation. Ice bin located on the right. Includes 7-circuit cold plate.